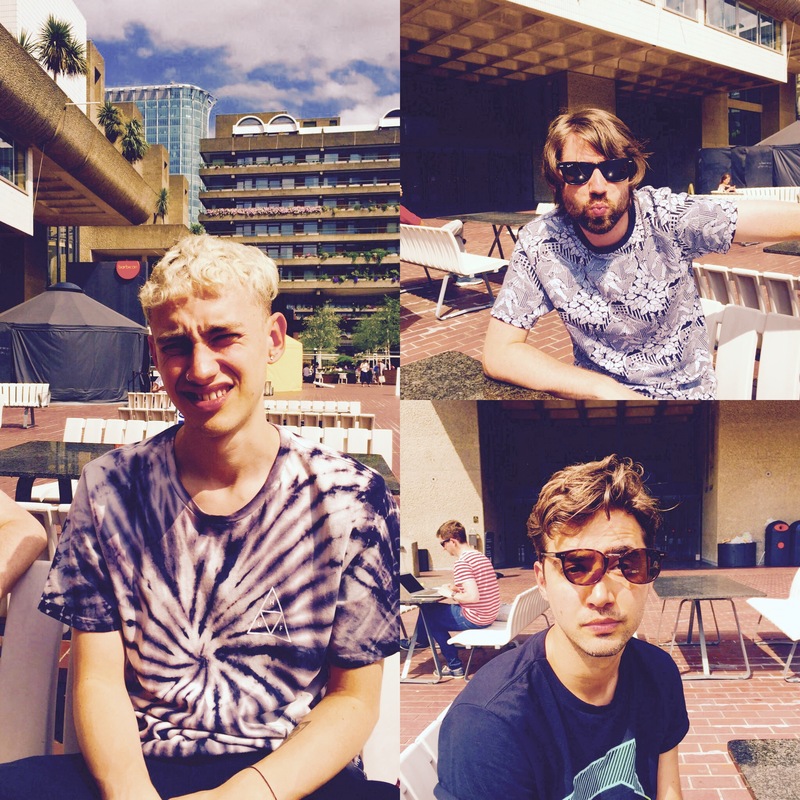 Years & Years Interview: "We're all crippled with anxiety." We're pretty much in love with Years & Years, as, it seems, are most of the world, with 2015 shaping up to be the year of Olly, Emre and Mikey. Blending synth pop with emotional lyrics, the band topped this year's prestigious BBC Sound Poll and even nabbed a Number One single with "King". Not only that, but thet aren't afraid to say what they believe in, with Olly in particular voicing his thoughts about feminism, LGBTQ rights and marriage equality. What a babe. PopBuzz: Hello Years & Years. How are you? Emre: Really upset. This coffee is terrible. Olly: Costa is the worst. It's my least favourite of the massive chains. Emre: This is actually undrinkable. PB: Possibly. How would you guys describe the last 12 months? Emre: The last 12 months has been non-stop. It's been busy but fun. It's a lot of work. Olly: It's non-stop busy fun. Mikey: We've developed all sorts of psychological issues. Olly: We're all crippled with anxiety. Olly: Broken up with partners. Mikey: Actually, my relationship has got better. Olly: [laughs] You said that with a lot of gravitas. PB: When you first put the album Communion up for pre-order it didn't have a definitive track listing. Were you still working on it at the time? Emre: There were a couple of tracks that weren't finished yet and we weren't quite sure which ones it'd be. Olly: We didn't write hundreds, but we had a lot of unfinished songs. Because it takes so long to get a song finished in the studio you have to really know whether it's going to go on the album or not. But then you have loads of demos that we worked on in our own time. PB: You've also shared a fair bit of the album as 'instant grats' for fans. Was that your decision? Olly: If it was up to us we'd have kept it all locked up tight and then made people pay extortionately for it. PB: You're not sat there in meetings planning the whole rollout plan, then? Olly: That is literally my idea of hell. Mikey: There are a lot of people in an office that do that for us. And they talk about us, which is weird. Emre: Yeah, they have meetings about us. We don't know what goes on. We just do stuff and see what happens. That's a metaphor for life in many ways. PB: Are you guys glad that the album is nearly out? Olly: Yeah! It just feels like it's been quite a long time coming. I feel like there was a point, even at the start of the year, where we thought how the f*ck are we going to get this album finished. I'm really proud of it, just as an achievement. It'll be nice to move on to something else, I think. PB: Will you move on quickly? Olly: What we should all do is side projects in the interim and then release a really weird album. Or, just do the same thing for the second album. PB: You could do that thing that Girls Aloud did where they had a documentary series following their side-projects. Olly: Oh I know the one! Emre: I'm going to bring out a range of pasta sauces. PB: Your music is quite dance lead, but there's a real emotional side to it, too. Was it important to convey that? Olly: It's just the music that we all respond to. We were listening to a lot of electronic music and dance music. Any song, if it's not just a throwaway one, then has meaning. But I just wanted to write about stuff that happened to me and I've been dumped…a lot. However, I didn't want to write a load of ballads, as that'd be so boring. PB: "Gold" is my favourite on the album. Surely it has to be the next single? Olly: I don't think it will be, but it should be, right? Mikey: I think it is "Eyes Shut". Olly: Don't tell people! We don't actually know what's the next single. Emre: “Gold” we did in two days. It was the last track we did. Olly: I think it's probably the best. PB: There aren't a lot of men doing straight up pop music in the UK. Why do you think this is? Olly: I know what you're saying. I guess there's this idea that if you're a guy you need to be in a band and play guitars, like The Strokes. Emre: With pop music usually it's quite electronic and it can often be about producers who then get a singer in. Maybe the band dynamic is peculiar for that now. But we do both laptop and electronic stuff, but we also have analogue stuff and a singer. Olly: You didn't ask this, but what's so weird is that women dominate the charts, and our top five best selling artists in the world are basically women, yet men and heritage bands headline all our festivals. Emre: But festivals are different. Festivals aren't really a venue for pop, historically. Emre: Historically they've been more a venue for rock, folk and dance music. A lot of pop isn't that live focused. It might also be that a lot of people who go to festivals don't buy pop music. PB: I think that is changing, what with Florence doing Glastonbury and Taylor headlining British Summer Time. Olly: It’s just weird. Glastonbury sells out before the line up is announced yet they still book predominantly male acts. PB: You guys are quite popular on social media. Do you get a lot of weird social media stuff, like "dad I love you"? Emre: We were talking about this the other day. Olly: Well I asked them why they were calling us dad. And they said, "Because you give us life." Often they just say "dad af lol". PB: Do you ever engage in conversations with them? Olly: I do. Sometimes I just reply to them on Instagram or Twitter. Emre: I do to the ones I know from way back. Olly: If they've drawn a picture I usually like it. PB: But you're not replying "You're also dad." Olly: I don't want to encourage the dad thing. I’m kind of allergic to all that internet speak, like “fleek”. PB: It means looking good, or on point. Olly: It’s not all bad. I do kind of admire our fans because they’re so different, even from my generation. What about emojis? How do you feel about them? Olly: I like the sad side eye face. Emre: I quite like the idea of limiting the emojis I think we should bring them back in. Emre: But the fun is using a limited amount of things to express stuff. That’s where it gets creative. I don’t think we need, like, every hair colour. PB: That's quite a controversial statement, Emre. Olly:I think they should be allowed their own emojis. They’re human beings, too. On that note let’s end this lovely chat. Thanks Years & Years. Bye! Years & Years release Communion on 10 July. Watch the video for "Shine" below. Jack Antonoff Interview: "Charli And I Will Work On Music Together'"